I’m a huge fan of pulled chicken. There are so many tasty ways to use it—atop a nutritious salad, mixed into brown rice, sandwiched between a whole grain bun or even on lettuce leaves if you’re looking to go low-carb. Plus, you can make it in the slow cooker, so it’s basically fuss-free. It’s a huge hit at parties, with the kiddos or even for a quick weeknight dinner. It’s a meal that everyone loves! In a small bowl, mix barbecue sauce, Worcestershire sauce, spices, salt and pepper. Pour mixture over chicken and stir to coat chicken. Cover and lock slow cooker. Cook on high for 4 hours or low for 7 to 8 hours. When you lift the cover, the inside will be very watery. This is normal. Carefully lift out chicken breasts and place on plate to shred with two forks. 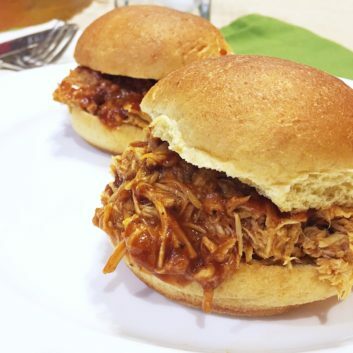 Place all of the shredded chicken back into the slow cooker and combine with the liquid. Mix until all of the liquid is absorbed. Season with additional salt and pepper to taste. Recipe makes about 8 cups. Serve on open-faced, toasted whole grain buns topped with coleslaw—yum. 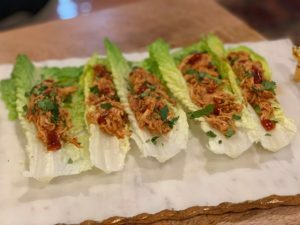 Or try a low-carb version and scoop onto lettuce leaves (as shown in photo above).